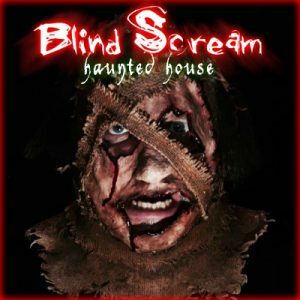 Blind Scream Haunted House is a Haunted Attraction located in Rohnert Park, CA. Team In-Corpse-A-Rated reviewed this attraction on October 8, 2016. Tucked away in the Sonoma County wine country is a haunt that is not for the timid or faint of heart. Blind Scream Haunted House is the brainchild of Drew Dominguez and Judy Groverman Walker and it delivers scares in various ways. From actors startling you from around every corner to the numerous visual effects, Blind Scream will not disappoint. The haunt consists of three main attractions: The Slaughter Shack, Uncle Chuckles 3D Mad House, and Blackout. The Slaughter Shack features the home of a hillbilly family whose culinary secrets are slowly revealed to its gruesome and shocking end. Uncle Chuckles is an insane asylum that evolves into a circus atmosphere, where the clowns taunt and disorient the audience. Blackout is an exploration of a common phobia: walking alone in the dark and not knowing what lurks ahead. By far, we enjoyed The Slaughter Shack the most and Uncle Chuckles second. As veteran haunt attendees, we left Blackout wishing it was a little darker and a little scarier. There were plenty of actors bringing their A-game to Blind Scream. The hillbillies in The Slaughter Shack would interact with us… describing how they wanted to kill and eat us. I was even given a marriage proposal by a hillbilly girl who wanted a new corpse husband! The victims were fairly believable, but not as convincing as the hillbillies as they brandished their knives and circular saws. At the end, we were chased out by a man revving his chainsaw. Uncle Chuckles made good use of physical interactivity. There was a section of netted rooms where actors were both throwing balls at us and firing an air cannon, which caused us to duck. Also, there were actors telling us to follow them… only to disorient us as we walked in circles. However, there was a girl who screamed at us a little too close to our ears, which took us from being startled to annoyed. The actors in Blackout played their parts well, as they would quietly await and startle us as we turned through the different corners. Yet, there was another girl in Blackout who screamed too close to our ears… ouch! The actors were dressed very appropriately for their various attractions. Farmer attire is what the hillbillies wore in The Slaughter Shack (some splattered with blood) and a few had burlap masks. Uncle Chuckles starts with two nurses at the hospital reception area wearing the traditional nurse’s uniform of white dresses and hats. As you walk into the circus, everyone is dressed as clowns, with the appropriate makeup. The actors in Blackout wore all-black clothes, which allowed them to blend in with the dark. Some had ghostly makeup and others wore masks. We couldn’t find anything in costuming that wouldn’t be appropriate for the three respective attractions. Overall, the real standouts were the custom-designed, burlap masks. There was no large, dominant sign outside of Blind Scream for customers to see. Instead, there were only small signs on stakes which pointed us to the location. The haunt had plenty of “Exit” signs for emergencies. All three haunts are wheelchair accessible except for Uncle Chuckle’s vortex tunnel, which wheelchair customers must bypass. At the vortex tunnel, there were a couple of staff members warning us about the steps; but, despite the warnings, I almost took a fall. The only queue entertainment while waiting in line was the background music. The staff members were very helpful… giving clear rules and regulations when entering each attraction. Blind Scream had restrooms, a concession stand, a gift shop, a photo shop, and visible security. The Zombie Paintball Shooting Gallery was fun, but we had a hard time aiming the paintball guns due to our poor abilities. A final bonus was the Creature Features Show with Al Omega. Anybody who grew up in the San Francisco Bay Area during the 1970’s will remember Creature Features on KTVU Channel 2 with Bob Wilkins. Al Omega carried on that spirit, inviting customers to his living room to watch bad movies, listen to his worst joke, and eat free popcorn. Blind Scream is located in the Sonoma Mountain Village redevelopment area in an office building. There is no façade outside, no music and no actors. However, with the “Creepy Clown” hysteria of 2016, Blind Scream can’t have any of it’s actors outside for their safety. The only visible indicators are the small signs on stakes pointing to Blind Scream’s open door; but, once you step inside, you know you have arrived at a haunted house. Facades of the three main haunts are visible, as well as the ticket booth and Zombie Paintball Shooting Gallery. The scary music in the background only reaffirms the notion of a haunted house. Blind Scream was a feast for our senses. The Slaughter Shack really stood out with its props, from the dismembered body parts to the table saws that were cutting people down the middle and a person being fed into a meat grinder. Upon entry, we saw a porch with a forced-perspective view of a cornfield (complete with scarecrows) including one that moved. Lights flashed on and off to the sound of lightning and, as we entered the front door of the porch, we discovered that each room was furnished with 1950’s-style décor. The kitchen and slaughter rooms took the horror level up several notches. In one hallway, body bags dangled from the ceiling… still twitching from the victims inside. The blues music in the background added to the hillbilly vibe. Uncle Chuckles was an attraction that required 3D glasses, which were provided by the nurses at the start. The circus atmosphere had vibrant, fluorescent colors under black light. The vortex tunnel effectively disoriented us as we walked through it. There was a room with explosives all around, followed by a dark room with loud, firecracker pop sounds. When we exited Uncle Chuckles, the nurses took back our 3D glasses, and we left through the claustrophobia tunnel. This was probably the closest we’d ever been to a birth canal since our actual day of birth! Blackout was very quiet. The only music was the ambient sounds from outside. We received a glow stick upon entry as our only source of light. The walls were painted black, and some of the hallways were narrower than others. We would hear sporadic banging on the walls, crackling sounds and heavy breathing as we traveled through the attraction. Blind Scream has an overall theme based off of their original character (Doc Hunter) and his cannibal family. Doc Hunter has his own Facebook page, where you can get background information of the characters of the haunt. The Slaughter Shack was a look at Doc Hunter’s hillbilly family house. It started as a normal, 1950’s-style home; but, as we entered different rooms, the horror and carnage got more intense, which gave us the point that we were next on the menu. Uncle Chuckles 3D Mad House took a look at where Doc Hunter’s Uncle resides: the insane asylum. But, once we got past the lobby, we entered into his mind: the psychotic circus. Truth be told, if we hadn’t asked, it wouldn’t have been clear that the two attractions were thematically tied together. Blackout was the more subtle theme: the darkness. It explored the things that go bump in the night. For those who have a fear of the dark, Blackout will be a very effective test of their phobia. There were various scares throughout Blind Scream. The actors focused on Debbie more, because she was a little more visibly scared than me. However, in Uncle Chuckles, a girl startled me as I walked through one of the drapes. Some scares were predictable and some were not. The Slaughter Shack’s scares were based off of threats and chasing. Uncle Chuckles’ scares were startles and taunting. Blackout’s scares were based off of quiet suspense followed by startles. The time it took to walk through the three main attractions of Blind Scream was approximately 30 minutes. With a General Admission price of $20, we feel it’s a very good bargain. The Fast Pass is $30 and you’ll have to contact the managers ahead of time for group and charity discounts. All available space was used in the building and there were no “dead zones” to be found. I say this is the best haunted house I’ve been to out of all the ones I’ve been to!!! I also enjoyed …show more the last ride.